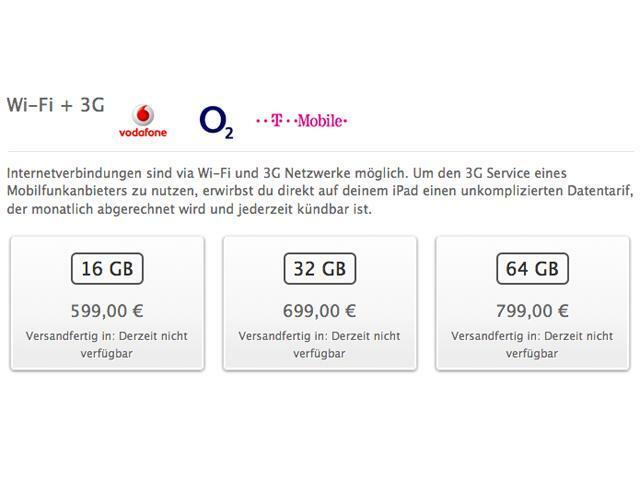 "Derzeit nicht verfügbar" is German for "not currently available" and that is what people are currently seeing for the iPhone 3G, iPhone 3GS, iPhone 4 and iPad 2 3G when they look them up on the Apple online store in Germany. Motorola has enforced a patent injunction it won against Apple in December for a "method for performing a countdown function during a mobile-originated transfer for a packet radio system." While this was declared as an "industry standard" patent seven years ago, companies must still pay a royalty to Motorola under the Frand (fair, reasonable and non-discriminatory) system of terms which calls for fair and reasonable terms. According to Apple, Motorola has been demanding payments that fall outside of that range while Motorola is saying that they have been offering reasonable terms to Apple since 2007. Only the iPhone 3G, 3GS and iPhone 4 are impacted in the phone line because Apple switched to a Qualcomm chip for the iPhone 4S, and that manufacturer has been paying the royalty to Motorola. On the iPad 2 side of the fight, as the Wi-Fi version does not work with a cellular network it is in the clear, but the 3G version does fall under the ruling. Apple has said that they are willing to pay the royalties going forward, but the current issue stems from the two companies being unable to reach an agreement on how much the Cupertino-based company should pay for the years where it was not doing so. Apple has said it plans to appeal the ruling, and although the items have been pulled from the online store, they are still available in the company's retail stores as well as through third-party authorized resellers. Potentially even more painful to Apple is another case Motorola won that says its push email technology infringes on a two-way paging technology patent the company was granted back in 2002. Should Motorola choose to enforce that injunction, iPhone users in Germany would no longer have their emails pushed to them as they are sent, but would instead have to do manual refreshes to fetch the mail. As this technology is not considered an "industry standard," Motorola is under no legal obligation to license the technology to them. Apple says the patent is invalid and plans to appeal. Currently the rulings only apply in Germany, but could have further impacts through out the European Union. While courts in different EU countries are allowed to reach different conclusions, they must explain why they did so. It looks like this Apple/Motorola fight could drag out for some time to come. UPDATE: In a statement to AllThingsD, Apple has said that the removal of the iPhones and iPad 2 3G are temporary and that the products should return to the online store soon. No reason was given as to why the reversal is happening.